I have been waiting for a long time to get my hands on a Samsung Galaxy Tab 750. I have only been reading about it and looking at the numerous images on various blogs and tech sites. It looked amazing from a distance. Android has been the talk of the town since the day Google released the first ever phone, The G1, running on Android. The rest is history. Android threatens iOS (Apple), and quite understandably, Apple has been suing almost every manufacturer who comes out with a device running Android. Ah!!! Apple, I don’t want to own and iPhone/iPad. This tab has a great first impression, and is sure to lure you to see more and more of it. It’s very sleek (at 8.6 cm), and light as well (565 gms). It’s a powerhouse of performance, with a 1GHz dual-core Tegra 2 processor and 1GB of RAM. Android Honeycomb compliments the superb hardware that it comes with, and promises to give you the best tablet experience you could wish for. Check out the technical specifications here. Moreover, this is only the initial tablet version of Android OS. Wait a few upgrades more, and I am sure, there would be a bagful of new features coming your way, which would make your experience with this “Game Changer” tablet more fun and enjoyable with style. Browser: With full flash support, and a huge 10.1″ screen, browsing would never be the same again. You will never see those dreaded “?”s again in any of your webpages. Tablets have changed the way we browse the internet: with the Samsung Galaxy Tab 750, it’s better. Video Playback: Full HD video playback with support for almost all types of video formats, you will not be left with any unplayable videos from your personal collection. 1080p video playback @30fps and the surround sound speakers, the device would definitely change how you watch your movies. Office Apps: The Galaxy Tab 750 isn’t only a fun device. It means serious business as well. It also suits someone who is always on the move. Creating, editing or viewing your powerpoint presentations or checking your excels, or formatting your documents has just become easier. You can now leave your laptop at home and show off your tablet to everyone at office. Google Mobile Apps: Need an app for anything at all? Well, fire up the Android Market and you will be able to find just any kind of app you want. The tablet comes preloaded with a host of Google apps like GMail, Gtalk (with video chat), Google Maps, Youtube etc. These apps have been optimized for your large screen to take advantage of the larger real estate. Be it reading your mails, navigating through a city or video chatting with your dear ones, you would be amazed at the ease at which the tablet handles everything. With multi-tasking and Split-View support, the Honeycomb OS delivers all that is required of a tablet. Gaming: Tablets are relatively a new form-factor of portable devices. I believe that the games of today haven’t really have adapted well for a tablet, except for a few(mostly racing games). I am not sure what kind of games would be a hit on such devices. Games like Angry Birds have been a tremendous hit on mobile devices. I am expecting a rush of similar games, which are engaging and more fun to play on a tablet. With all the sensors that the Galaxy Tab has: Gyroscope, Accelerometer, Ambient Light Sensor and Compass, I would look forward for games which take advantage of this form-factor and the sensors, to perhaps invent a new category of games that make your experience more full-filling when it comes to raw entertainment. I am all excited about how this would change the future of entertainment. Books, Movies and Songs: Well, this tablet seems to touch each and every part of your life. Read your rented/bought books, buy/rent videos and songs, and carry everything with you. The built-in 7000 mAh battery promises you a video playback upto 9 hours and Audio playback upto 72 hours. So, if you are on a long journey, your collection of books, videos and songs would always keep you busy. Say Bye Bye to those boring rides. For a full list of features, visit the official Samsung Galaxy 750 page here. 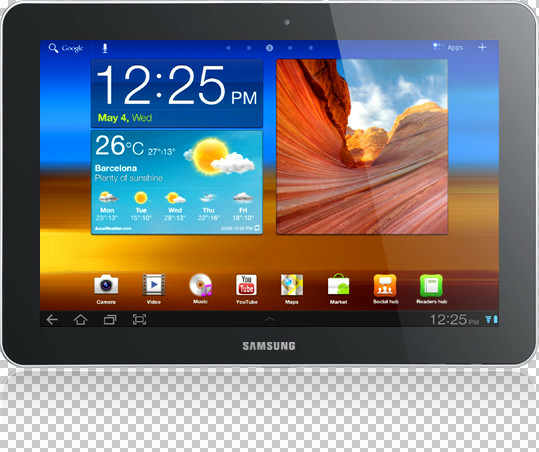 The Samsung Galaxy Tab 750, promises to be everything that you wished for. Never before you would have thought about having a video conference with your family members while you were on a bus. Never again you will be lost in a city. You will never miss your mails and news while you are away from your desktop/laptop. You can carry your entertainment wherever you go. This device does it all. Now you can be more productive, effective and all the more connected to your smart life with style. The Samsung Galaxy Tab 750 dares to enter your life and take control. Are you ready yet? I am. It’s time to TAB! please explain me..what are the key things which make it better than an I pad? I have read on many review sections, that I PAD is by far the best tablet in the market. @Kunnu: Yeah, I haven't compared it with iPad. I love Android (of course I have to since I work with that), and this is by far the best Android tablet. This is a nice post man.. Good way to review..
Nice blog entry. Please visit my blog entry and promote it if you like it. We at Accountants Co. offers you to focus on your business key activities and let us to do the hard part i.e. record keeping of all financial transactions in software of your choice, Quick Books, Peach Tree, Simply Accounting, Sage, NetSuite or SAP depending upon the location of your abode. Wow Good article on the Galaxy tab. You can read and promote my post here: 10 Rock-Solid Reasons why you should GET TABBING now! Nice post and writeup. You can check out my views on Galaxy Tab too and appreciate if you could comment on my blog and or promote on indivine. . Promoted your post too, All the best for contest. Nice post with highlighting the most useful features of Tab. All the best. If you like my article, you can promote it. Another great review of the features! Do check out my review A Knight's Tale – Sir Samsung Galaxy Tab 750 please.